Increases in cholinergic transmission are linked to depression in human subjects and animal models. 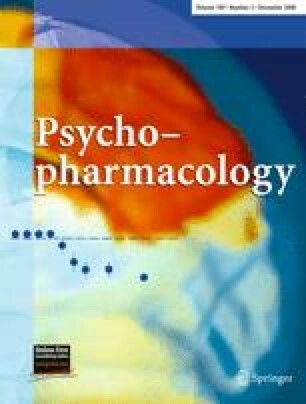 We therefore examined the effect of decreasing nicotinic acetylcholine receptor (nAChR) activity in tests of antidepressant efficacy using C57BL/6J mice. We determined whether the noncompetitive nAChR antagonist mecamylamine had antidepressant-like effects in the forced swim test (FST) and tail suspension test (TST). These experiments were repeated in mice lacking either the β2- or α7-nAChR subunits to identify the nAChR subunits involved in mediating the antidepressant response to mecamylamine. Adult mice on the C57BL/6J background were acutely administered mecamylamine i.p. 30 min before testing in the FST or TST. A dose–response study showed that mecamylamine significantly decreased immobility time in the TST at the 1.0-mg/kg dose but did not alter baseline locomotor activity. The competitive nAChR antagonist dihydro-β-erythroidine, but not the blood–brain barrier impermeant antagonist hexamethonium, also decreased immobility in the TST. One milligram per kilogram of mecamylamine also significantly decreased time immobile in the FST whereas both β2- and α7-knockout mice were insensitive to the effects of mecamylamine in the FST. Decreased activity of central nAChRs has antidepressant-like effects in both the TST and FST and these effects are dependent on both β2 and α7 subunits. Therefore, compounds that decrease nAChR activity may be attractive new candidates for development as antidepressants in humans. This work was supported by NIH grants DA13334/AA15632, MH77681, and DA00436 and the NARSAD Foster Bam Award.